In NATO Speech, Trump Scolds Leaders But Doesn't Recommit To Defense Pledge : The Two-Way At a dedication for two memorials, President Trump told gathered NATO leaders that it was "not fair" to U.S. taxpayers for NATO countries to spend less than they pledged on their own national defense. President Donald Trump and British Prime Minister Theresa May await a photo opportunity at a NATO summit meeting in Brussels on Thursday. At a NATO summit in Brussels, President Trump marked the unveiling of memorials of the Berlin Wall and the Sept. 11 attacks with a speech that, among other things, told gathered NATO leaders their levels of defense funding are "not fair" to U.S. taxpayers. Trump also omitted any clear statement of support for Article 5, the NATO mutual-defense pledge — something other leaders had been hoping to hear. The Associated Press described Thursday's speech as an "unprecedented one-two punch" that "further rattled" an already anxious Europe. And at home, one Democratic leader called the remarks "condescending" and an "embarrassment," while Republican Sen. Rand Paul said he applauded Trump's stance. The speech opened with a moment of silence for the Manchester attack and with an extended reflection on the danger posed by terrorists, who Trump called "losers," before pivoting to the question of defense funding. 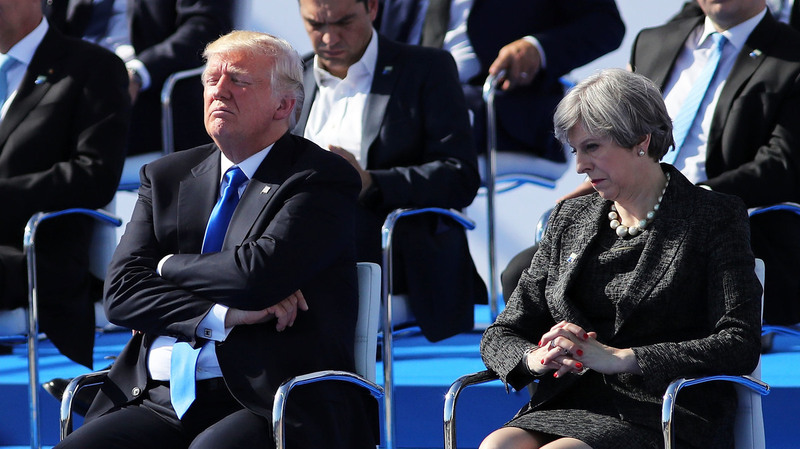 It had been widely expected that Trump would use the speech as an opportunity to call for other NATO leaders to increase their own military spending, as NPR's Tamara Keith explained on Morning Edition before the event. "Do your part, pay your fair share. That's his basic message," Tamara reports. "He wants them to keep their commitments that they've made — they've set this goal of spending 2 percent of their nations' GDP on national defense, to contribute to the strength of the alliance." The U.S., which has by far the largest military budget in the world, spends well more than that — 3.6 percent of GDP last year, for instance, according to The Economist. Most NATO members, meanwhile, spend less than the 2 percent benchmark. Trump said in his speech that he has been "very, very direct" with NATO leadership about the need for member nations to increase their military budgets. The current situation, he said, "is not fair to the people and taxpayers of the United States. And many of these nations owe massive amounts of money from past years and not paying in those past years. Over the last eight years, the United States spent more on defense than all other NATO countries combined." Just as notable as what Trump said, however, is what he didn't say. Other NATO leaders wanted him to "express a commitment to Article 5 of the NATO charter, which says that an attack on one nation is an attack on all nations," Tamara reports. "President Trump, during the campaign, had not shown a full commitment to that." And he didn't really clarify the situation on Thursday. Trump did mention Article 5 in his speech — it was unavoidable, given the memorial he was unveiling. "We remember and mourn those nearly 3,000 innocent people who were brutally murdered by terrorists on September 11th, 2001," he said. "Our NATO allies responded swiftly and decisively, invoking for the first time in its history the Article 5 collective defense commitments." But that was a historical observation, not a pledge for the future. And while Trump made rhetorical nods toward common defense, speaking of "the commitments that bind us together as one" and saying the U.S. "will never forsake the friends who stood by our side," he didn't explicitly recommit the U.S. to Article 5. Trump also took a dig at the cost of the brand-new building where he was speaking. "I never asked once what the new NATO headquarters cost. I refuse to do that," he said, invoking the issue by pretending not to talk about it. "But it is beautiful." Rep. Steny Hoyer of Maryland, the second-ranking Democrat in the House of Representatives, said in a statement that Trump "should not be lecturing our closest and most steadfast allies." "I was appalled by his condescending remarks to NATO leaders today, which were an embarrassment for our country," Hoyer said, suggesting Trump should instead reaffirm the U.S. commitment to common defense. Another Democrat, Rep. Jared Huffman of California, more subtly critiqued Trump's decorum at the summit, retweeting a video showing Trump pushing aside another leader. Sen. Rand Paul, R-Ky., meanwhile, said he applauds Trump "for holding NATO leaders accountable." "We shouldn't be subsidizing other nations," he said on Twitter.